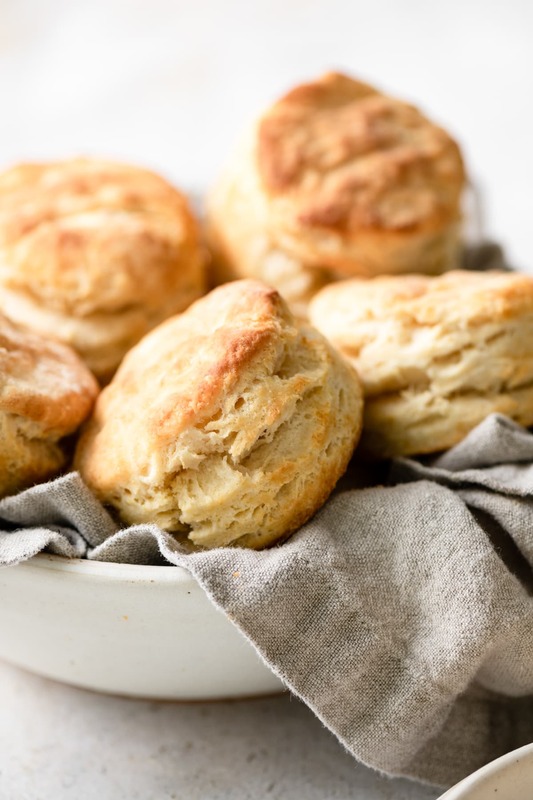 The only homemade biscuit recipe you’ll ever need! These turn out tall and flaky, perfectly tender and deliciously buttery every time! Plus they’re so easy to prepare. Here you’ll learn all the tips and tricks to perfecting them. Once you start making homemade biscuits you’ll never look back, a store bought mix just doesn’t even compare. These are one of the best dinner sides out there! They’re quick to throw together, no kneading or lengthy rise times here. And you can have them ready in under 30 minutes! 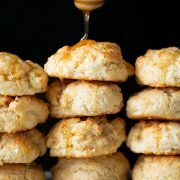 And let’s be honest, who on this planet doesn’t love a warm from the oven, buttery homestyle biscuit?? It’s comfort food at it’s best. Basic ingredients, old fashioned method, super satisfying results and happy eaters all around. Serve them as is in all their buttery glory, or sandwich them with honey or homemade freezer jam. What Ingredients do I Need for Biscuits from Scratch? All-purpose flour – preferably use unbleached flour it’s naturally aged and it tastes a little better, bleached works fine too though if that’s what you have. Baking powder – this helps generous amount helps the biscuits rise nice and tall. Sugar – this little amount adds a nice balance the salt. Baking soda – since buttermilk is acidic this is added in addition to the baking powder. Salt – this keeps them from being one dimensional. I don’t like a lot of salt though as some recipes have. At the 2 cup flour ratio some would double the salt I use. If you decide you want a little more use 3/4 tsp. Unsalted butter – salted butter will work too but keep in mind it melts a little faster so work quickly. If using salted reduce salt in recipe by 1/4 tsp as there’s generally 1/4 tsp salt per 1/2 stick of butter. Preheat oven to 450 degrees and prepare a baking sheet. Whisk dry ingredients: in a large mixing bowl whisk together flour, baking powder, sugar, baking soda and salt. 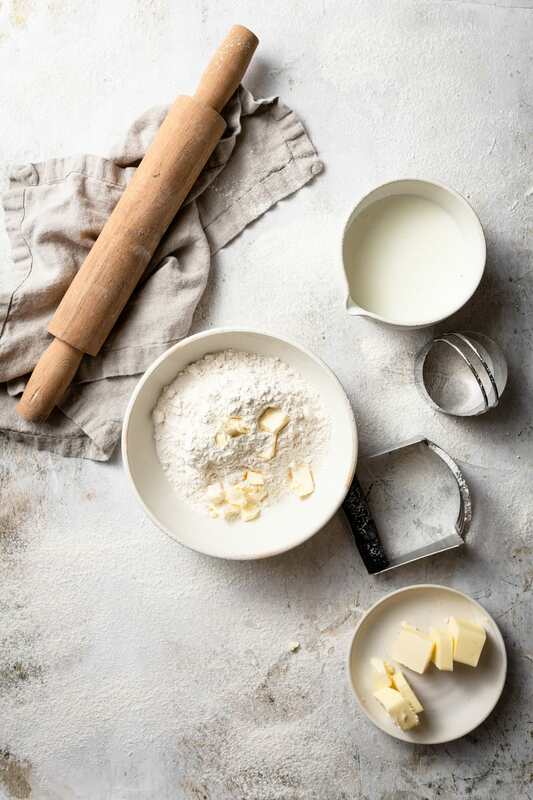 Cut butter into flour mixture: cut 7 Tbsp cold butter into small cubes. Add to flour mixture and cut butter into mixture with a pastry cutter until there are small clumps of butter about the size of peas, make a well in the center of mixture. Fold in liquid: pour buttermilk into well then fold mixture with a rubber spatula until it comes together. Bring dough together: gently turn and press dough to bring together completely, then drop onto a lightly floured surface. 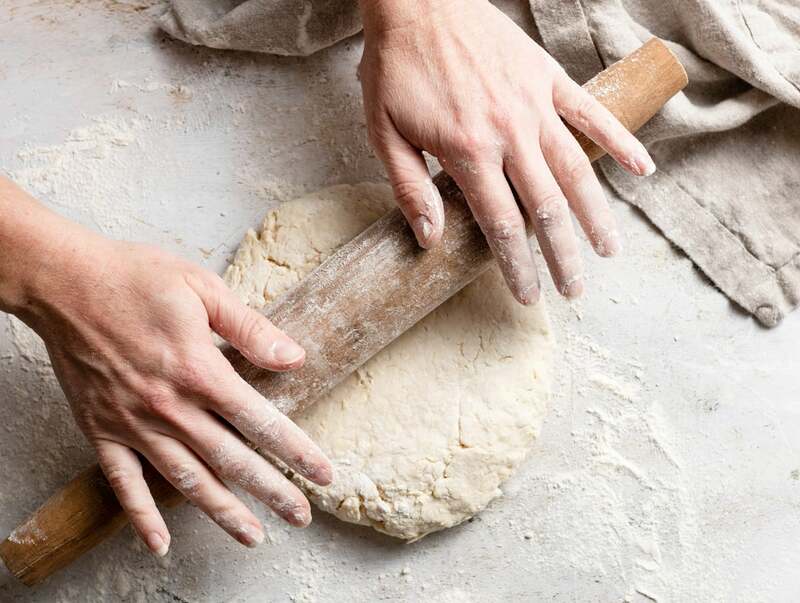 Roll and fold, repeat: GENTLY roll dough out to a large rectangle, about 10 by 9. Fold in half then repeat gently rolling and folding process twice more. Gently roll and shape final rectangle to 9 1/2-inches by 4 3/4-inches (sorry for such a specific length, this will just give you the tallest amount and more biscuits). Cut into rounds: using a small biscuit cutter cut into 8 rounds (cut very very closely together and just within the outside edge. Align on baking sheet: transfer to baking sheet spacing apart. Use up extra dough: bring remaining dough scrapes together and gently press and form a small rectangle, cut 2 more biscuits, transfer to baking sheet. Bake: bake in preheated oven 11 – 13 minutes until golden brown and cooked through. Brush with 1 Tbsp melted butter and serve warm. Use a fair amount of butter (7 Tbsp in the dough is perfect I think) and only use real butter. Butter makes these flavorful and tender. They won’t turn out the same with margarin, shortening, coconut oil, etc. Use COLD butter. One of the number one rules of biscuits is really cold butter. This way it isn’t worked into the flour but rather melts in tiny pools into the biscuits in the oven making them nice and flaky. You may even want to freeze for 10 minutes first on a warm day. Use cold buttermilk to keep the butter cold. Use aluminum free baking powder. Why? With this amount added if it’s not aluminum free they may have a light metallic flavor. You can find it next to the standard baking powder at the grocery store. Be gentle with the dough for the fluffiest biscuits. Roll the dough out. I know some people would be sure to argue with me on this one. Many people believe in the pat method, but I say warm hands melt the butter if patting. If you roll gently you’re basically doing the same thing as a patting (it comes down to pressure right?) and it’s faster, so again less butter melting. Flour the biscuit cutter and don’t turn and twist when cutting. Just press firmly and lift or it will seal edges and they won’t rise as high. Don’t toss the scraps. I lot of people say don’t use them, I say why waste it? Bring scraps together and use it up to get two more biscuits. They won’t be as fluffy but they’ll still taste great! Bake at high heat. That super hot temperature helps them rise up nice and tall and bake to golden brown perfection. No. For best results make your own blend leaving you with control of the ratios. This mixture also has baking soda which is something self rising flour lacks. What if I Don’t Have a Biscuit Cutter? No problem! You can just cut the dough into squares instead using a large knife. Can I Make the Biscuit Dough Ahead of Time? No. 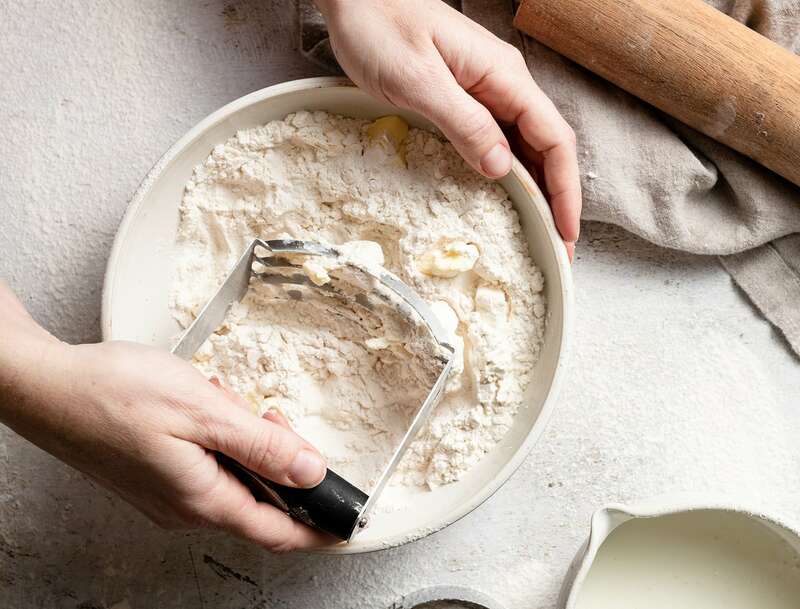 For best results the dough should be baked right away, the baking powder and baking powder won’t have the same leavening power if baked later on. Make the buttermilk substitute by adding 1 tbsp lemon juice or white vinegar to a liquid measuring cup, add enough milk to equal 1 cup ( so you’ll be adding 3/4 cup + 3 Tbsp. Use anything but skim). Whisk and let rest 5 minutes in the fridge. Can I Make the Biscuit Dough in a Food Processor? Yes. A food processor can be used instead of doing it by hand. Just be sure that’s there’s still pats of batter and don’t over-work the dough, only mix until combine when adding buttermilk. I believe mixing by hand yields the best results but in a rush a food processor will work too. 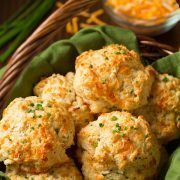 How to Keep Biscuits from Being Dry? Add enough liquid to the batter. I’ve found 1 cup buttermilk is the max I can add without dough being sticky and it ensures the biscuits have enough moisture. Don’t over-bake, the general rule to all baked goods. If baked longer than needed they’ll start to dry out. How to Store and Reheat Biscuits? Let’s be honest, biscuits are much better the day they’re made but if you happen to have some left store at room temperature or freeze them. Reheat in short bursts in the microwave, or wrap in foil and reheat in a 350 degree oven until heated through. 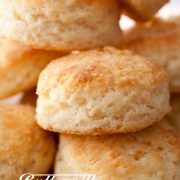 The only Homemade Biscuit recipe you'll ever need! These turn out tall and flaky, perfectly tender and deliciously buttery every time. Everyone is sure to love these! Preheat oven to 450 degrees. Line an 18 by 13-inch baking sheet with a silicone baking liner or with a sheet of parchment paper that's oven safe to 450 degrees. 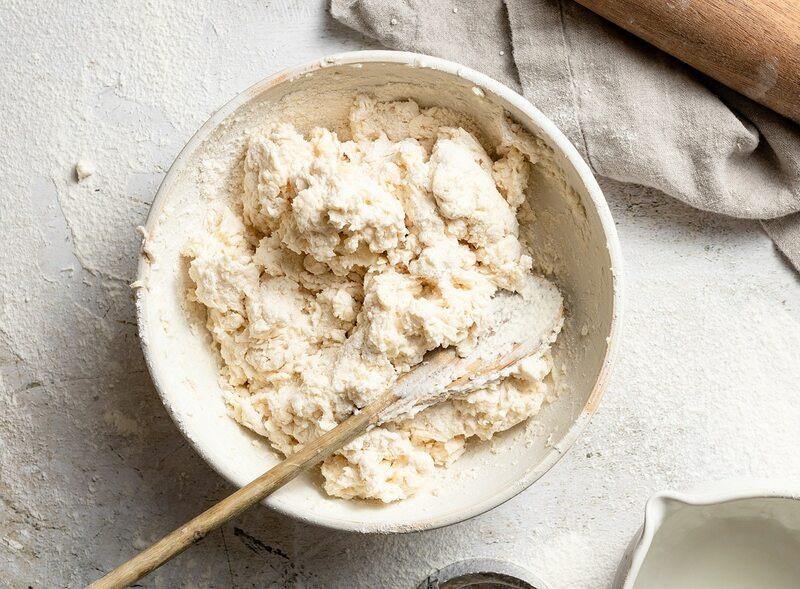 In a large mixing bowl whisk together flour, baking powder, sugar, baking soda and salt for 20 seconds. Cut 7 Tbsp cold butter into small cubes. Add to flour mixture and cut butter into mixture with a pastry cutter until there are small clumps of butter about the size of peas, make a well in the center of mixture. Pour buttermilk into well then fold mixture with a rubber spatula until it comes together. Gently turn and press dough to bring together completely, then drop onto a lightly floured surface. Gently roll dough out to a large rectangle, about 10 by 9. Fold in half then repeat gently rolling and folding process twice more. Gently roll and shape final rectangle to 9 1/2-inches by 4 3/4-inches (about 1-inch high). 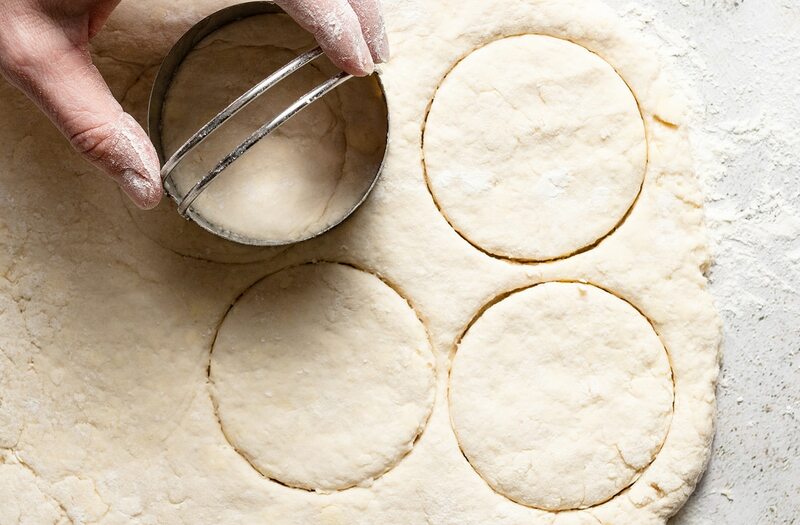 Dip a 2 1/4-inch or 2 1/3-inch round biscuit cutter (or tall cookie cutter) in flour, cut dough into 8 rounds**. Transfer to baking sheet spacing apart. Bring remaining dough scrapes together and gently press and form a small rectangle, cut 2 more biscuits, transfer to baking sheet. Bake in preheated oven 11 - 13 minutes until golden brown and cooked through. Brush with 1 Tbsp melted butter and serve warm. 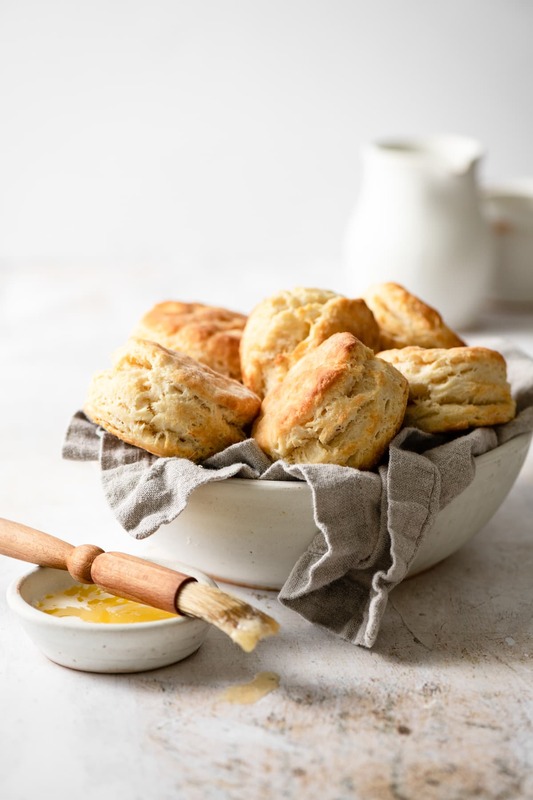 *Since there's so much baking powder used in this recipe only use aluminum free baking powder so biscuits don't end up with a slightly metallic-y flavor. **Cut biscuits very closely together and just within the outside edge. And don't turn and twist cutter just press firmly and lift or it will seal edges and they won't rise as high. Don't have a biscuit cutter? Just cut into squares instead.